A 76-year-old woman's home was ransacked on Lundin Road in Crossford, South Lanarkshire. A man who held a woman hostage while raiding her home may have fled Scotland. 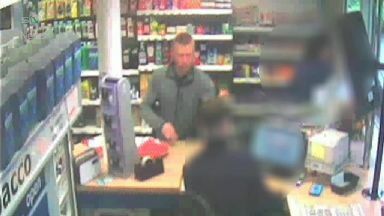 The robbery happened on Lundin Road in Crossford, Fife. A 76-year-old woman was held hostage before a number of items were stolen from her property at 7pm on Friday, May 4, last year. The robber may have links to Greenock and Clackmannanshire but it's thought he may have fled to Northern Ireland or the Republic of Ireland. Inspector Kelly McEwan said: "The man in the CCTV images may have information that can help with the ongoing investigation and one line of inquiry for us is that he may now be somewhere in either Northern Ireland or the Republic of Ireland. "I'd ask that communities from both countries look at our footage and get in touch as a matter of urgency if they believe they recognise the man pictured. "In addition, anyone with any further information relating to this robbery should also contact police immediately."